Over the past 15 years of teaching yoga to children I have come to appreciate what an amazing activity yoga is for supporting speech, language and literacy development. As children many of us were told to sit still and listen, and sadly comments such as this can still be heard in schools around the world. For some children this is an either or proposition, they can either sit still or listen, and moving their bodies helps them to self-regulate and attend. Ask any speech pathologist and they will tell you about the connection between movement and expressive language; having kids move their bodies during speech therapy sessions is akin to greasing the wheel. This is why asking children to be quiet in yoga class is a true self-regulatory challenge. I recall working with a selectively mute child who would only speak during movement-related activities, and at these times she was quite talkative. 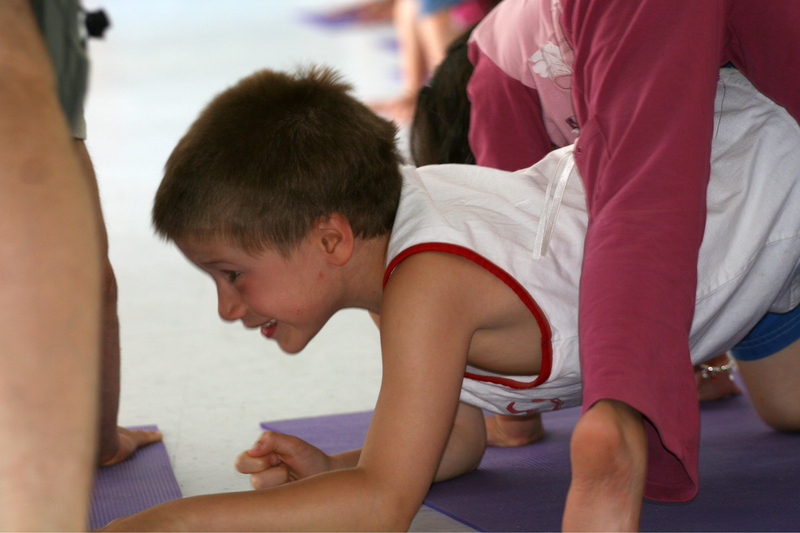 Opportunities for child-directedness in yoga class provide important practice in initiation, sequencing, coordinating movement and expressive language, and creativity. Children are likely to be more relaxed during yoga class which makes them much more receptive to learning, and the calmness they experience afterwards will contribute to increased word retrieval and fluency. Acting out stories or moving to kid friendly songs provides the opportunity to link words or phrases to corresponding movements or actions. Kinesthetic learners will be much more likely to follow along and retain a story when it is acted out physically, and if a child’s receptive language is challenged, observing classmates and teachers perform will provide valuable visual support. Many young children, particularly those with developmental delays, lack core strength and postural support. Unfortunately when this is the case, the mechanisms of breathing (the ribcage and the diaphragm) become fixed and locked and engaged in holding the body upright. Yoga increases core strength and postural support, which frees up the mechanisms of breathing for their intended purpose, and ultimately supports self-regulation and expressive language. One needs to be able to take a deep inhalation followed by a long controlled exhalation both to activate the parasympathetic nervous system and to create speech, and an unencumbered diaphragm and rib cage are necessary to do this. Yoga can be extremely strengthening for the diaphragm; for example breathing in Bow Pose against the floor/gravity is like resistance training for the diaphragm. Having a strong diaphragm not only allows one to take deep inhalations, but it allows us to make forceful exhalations, an important ability in blowing our noses to clear our nasal passages. Breathing in bow pose also provides valuable proprioceptive input to the abdominal area, which helps students identify the place you want them to breathe into. Speech and Language Pathologists have been attending my Every Kid’s Yoga Teacher Training for years, which indicates to me that the relationship between these two seemingly disparate disciplines has become increasingly appreciated and accepted.